The comment itself is accurately quoted, but the title was created by the book's authors. Until 1929, when the Young Woman's Journal and the Improvement Era merged, the Era published a monthly "Editor's Table" column. 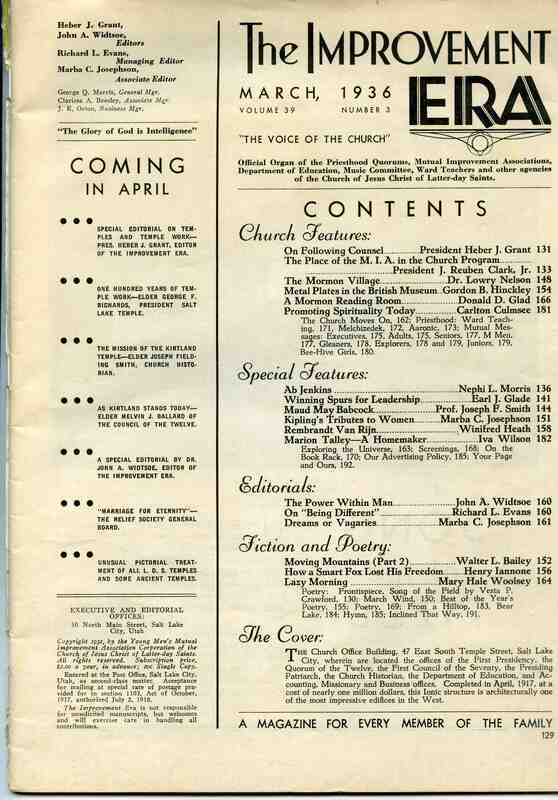 During the administration of Joseph F. Smith as Church President, there were 655 articles published in the Editor's Table. The majority of these were short, anonymous comments with titles like "Around the Earth in Nine and One-Half Minutes" (Aug. 1903), a comment about completion of the Pacific telegraph cable on July 4th, 1903. For 15 months, beginning in November 1907, there was also a monthly column titled "Seventy's Council Table" with Elder B. H. Roberts, a member of the First Council of Seventy, identified as its author. Through this column, the First Council communicated with local (stake) Seventies quorums. In February 1909, the scope of the Seventy's Council Table was expanded to include all priesthood quorums (Aaronic Priesthood, Elders, and High Priests, in addition to the Seventies) and its name was changed to "Priesthood Quorums' Table." With this change, a committee was appointed by the First Presidency, "The General Committee on Priesthood Outlines." Elder Rudger Clawson of the Quorum of the Twelve was the committee's first chairman. The committee was asked to provide a uniform course of study for the quorums. Assisting Elder Clawson on the original committee were Elder David O. McKay of the Twelve, Bishops Charles W. Nibley, Orrin P. Miller, and David A. Smith, of the Presiding Bishopric, along with Edward H. Anderson, Nephi Anderson, Stephen L. Richards, Sylvester D. Bradford, John M. Mills, Joseph B. Keeler, David O. Willey, Jr., Charles C. Richards, Henry H. Blood, Joseph J. Cannon, and P. Joseph Jensen. Occasionally individual authors were identified. Some of these included Heber J. Grant, Rudger Clawson, David O. McKay, Levi Edgar Young, Seymour B. Young, B. H. Roberts, and P. Joseph Jensen, along with various ward bishops and stake high councilors who contributed without even being members of the General Committee. A large percentage of the articles were published anonymously, from which we might reasonably conclude that they were likely written by members of the General Committee, whose column it was. "The new Movement Among the Priesthood Quorums," an article by the First Presidency introducing the General Committee and the Priesthood Quorums' Table column to Era readers, (Mar. 1909). "Enrollment and Ordination," a letter from the First Presidency addressed "to stake presidents and bishops" (June 1916). As stated above, the Priesthood Quorums' Table was the medium of communication between the General Committee and the local quorums. When the April 1910 "Origin of Man" comment and the June 1916 "Enrollment and Ordination" comment are viewed side by side, it becomes clear which of the two was First Presidency instructions to the priesthood and which was not. Once again, among 343 comments published in the Priesthood Quorums' Table during the administration of President Joseph F. Smith, there are just two that carried the names of all three members of the First Presidency and only one other article that was clearly identified as having been written by President Smith. What is never said anywhere in the Era is that articles or comments published without an author identified should be attributed to the First Presidency. A total of 998 articles (655 in the Editor's Table and 343 in the Priesthood Quorums' Table) were published during Joseph F. Smith's administration. The majority of these 998 articles are unsigned, anonymous comments. It is completely unreasonable and illogical to conclude that all of these anonymous comments were written by the First Presidency. Remember that 22 of the 998 articles are clearly identified as First Presidency statements. It is equally inappropriate to suggest that the anonymous articles were written by President Joseph F. Smith. Keep in mind that 176 of the 998 articles clearly bear his name. "It may be well to remind our readers," said President Joseph F. Smith, "that the Era is not responsible for the individual views or opinions expressed by contributors to its columns." (Editor's Table, Dec. 1915.) This would be one very good reason why First Presidency statements and articles written by the Church President were always properly identified. In the case of the April 1910 Priesthood Quorums' Table, none of its five comments has an author identified. All are anonymous, all are unsigned, and not one of them qualifies as First Presidency instructions to the priesthood. Coincidentally, at BYU in April 1910, three instructors were teaching "theories on evolution as applied to the origin of man" along the lines of the April 1910 Priesthood Quorums' Table statement that "the mortal bodies of man [may have] evolved in natural processes to present perfection." "teachers in a Church school ... could not be given opportunity to inculcate theories that were out of harmony with the recognized doctrines of the Church, and hence that they be required to refrain from so doing." The 1910-1911 evolution controversy at BYU strongly suggests that the April 1910 Priesthood Quorums' Table comment does not represent the thinking of President Joseph F. Smith. "Our father Adam — that is, our earthly father — the progenitor of the race of man, stands at the head, being 'Michael the Archangel, the Ancient of Days ',... he was not fashioned from earth like an adobe, but begotten by his Father in Heaven. "He [Adam] took upon him an appropriate body, the body of a man, and so became a ' living soul ' [and] all who have inhabited the earth since Adam have taken bodies and become souls in like manner. In a speech delivered Dec 7, 1913 at Mesa, Arizona and published in the Deseret Evening News, Dec. 27, 1913, President Joseph F. Smith said, "Adam, our earthly parent, was also born of woman into this world, the same as Jesus and you and I." The claim is made in Mormonism and Evolution that the informal April 1910 comment provides "additional insights about the intent" of the First Presidency's formal November 1909 position statement. According to Mormonism and Evolution, the First Presidency's 1909 "anti-science language"  is clarified by the April 1910 comment. The Mormonism and Evolution view of the April 1910 comment contradicts what President Smith said in 1913 and what the First Presidency said in 1912. It also contradicts President Joseph F. Smith's 1911 Editor's Table article about evolution being taught at BYU "although it is well known that evolution [is] in conflict on some matters with the scriptures, including some modern revelation." The anonymous comment about the 'Origin of Man' found in the April 1910 Priesthood Quorums' Table does not represent the thinking of President Joseph F. Smith. And for several obvious reasons outlined above, it cannot be viewed as First Presidency instructions to the priesthood. The April 1910 Priesthood Quorums' Table comment does not belong in Mormonism and Evolution's Appendix collection of "other authoritative materials." William E. Evenson and Duane E. Jeffery, Mormonism and Evolution: The Authoritative LDS Statements, (Salt Lake City: Greg Kofford Books, 2005), p. 39; hereinafter cited as Mormonism and Evolution. Mormonism and Evolution, p. 40. After the death of President Joseph F. Smith in November 1918, it became the pattern that the Church President also served as editor of the Era, with the help of an associate editor. 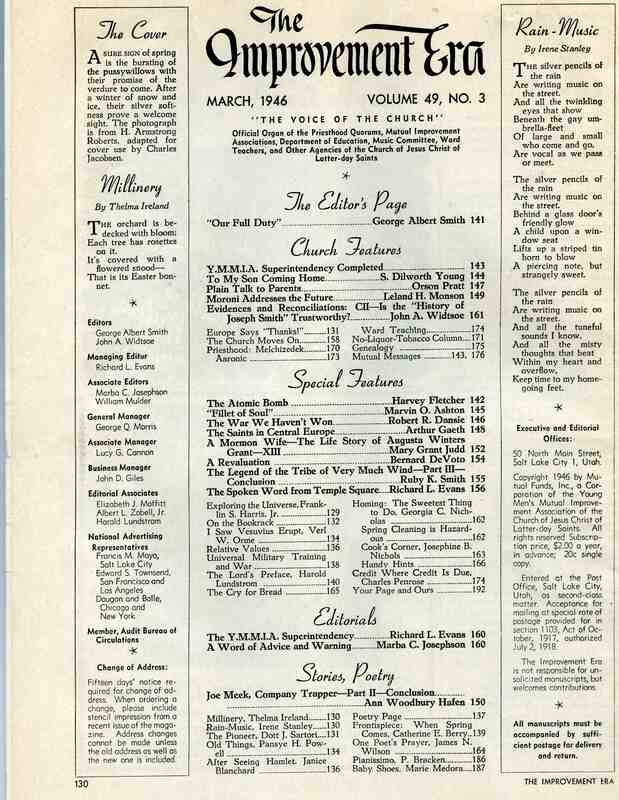 The March 1936 issue lists Heber J. Grant and John A. Widtsoe as editors. 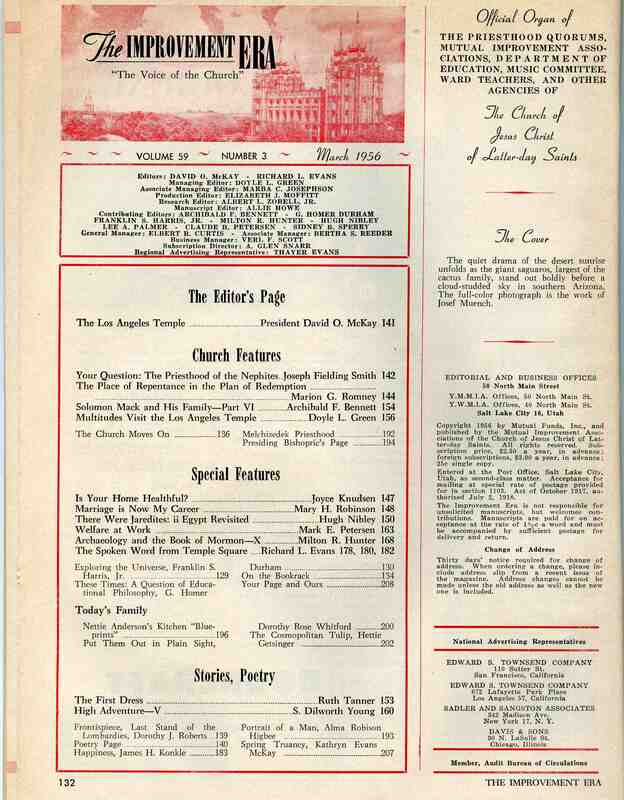 Ten years later, in March 1946, the editors were George Albert Smith and John A. Widtsoe. In March 1956, the editors were David O. McKay and Richard L. Evans. 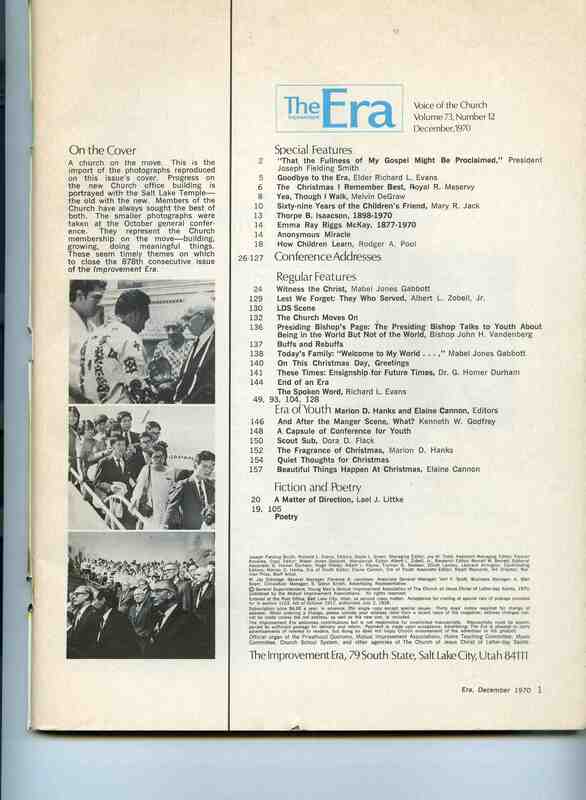 And the last issue of the Improvement Era, published in December 1970, listed Joseph Fielding Smith and Richard L. Evens as editors. Mormonism and Evolution, p. 42. Mormonism and Evolution, p. 27. Mormonism and Evolution, p. 45. See Gary James Bergera, "The 1911 Evolution Controversy at Brigham Young University," in The Search for Harmony, Salt Lake: Signature Books, 1993, 23-41. As quoted by Joseph Fielding Smith in Man: His Origin and Destiny, Salt Lake City: Deseret Book, 1954, p. 345; see also James R. Clark, ed., Messages of the First Presidency, 6 vols., [1965-75] 4:265-267. As quoted in Mormonism and Evolution, p. 23. Reprinted also in Chapter 37 of the 2000-2001 Melchizedek Priesthood and Relief Society study guide, Teachings of Presidents of the Church: Joseph F. Smith, pp. 335-336, and in the Feb. 2002 issue of the Ensign, p. 30. Mormonism and Evolution, p. 29. Mormonism and Evolution, p. 30. This is an apparent reference to the paragraphs associated with note 9, above. The 2000-2001 and 2002 reprints of the 1909 statement are recent affirmations of "the Church's doctrinal position on ... evolution" (Introductory paragraph, Ensign, Feb. 2002, 26). "This is the Improvement Era from 1910, this is under the heading ' Priesthood Quorums' Table.' It's an anonymous statement, it's not signed by the First Presidency, but it is published in the Improvement Era. ... Joseph F. Smith was president of the Church at this time and was listed as the editor for The Improvement Era. The authors of Mormonism and Evolution: The Authoritative LDS Statements were not as careful as was Trent Stephens in this respect. Gary, thanks for your research here. I think you make a persuasive case about what Joseph F. Smith's position was.